Optrex itchy eye drops are specially formulated eye drops, which relieve the irritation caused by pollen and refresh sensitive, uncomfortable eyes. 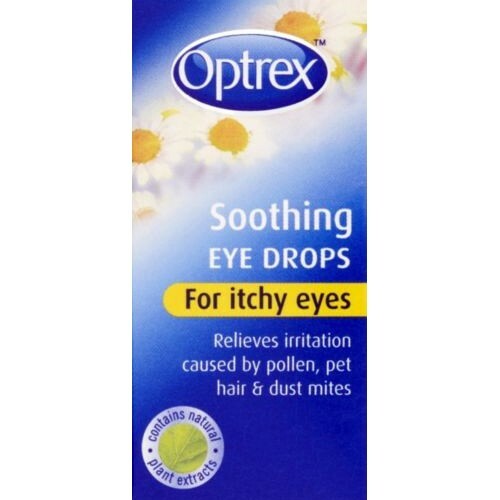 Optrex Itchy Eye Drops have been specially designed, using purified water and natural plant extracts to combat the irritation caused by pollen, housemites and other particles e.g. pet hair. Balanced at the natural pH level of tears. Suitable for every day use. How to use Optrex Itchy Eye Drops? To help avoid infection (and cross-contamination), don't touch the bottle tip with your finger or eyes. Tilt your head back, put the right number of drops into your eye and blink several times to make sure the drops cover your eye. If you don't like putting drops into your eye, try closing the eye and gently pulling the lower lid down. Aim the drop into the inside corner of the eye, then open it and let the drop run down. Or if you are suffering from dry, irritated eyes try Optrex ActiMist Eye Spray for an easy to use, drop free solution.